When walking into your college dining hall there is a whirlwind of activity and getting food to a table is almost as difficult as figuring out what chi square equals. With that being said, it is certainly not ok to throw etiquette out of the window and embrace an "every man for himself" motto. 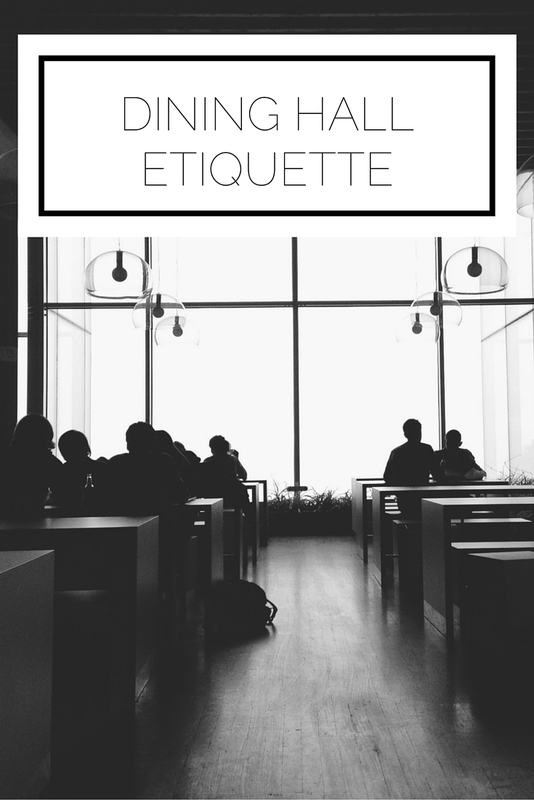 Here are some guidelines to help you navigate the dining hall with grace and style. In compliance with everyday etiquette you must always have a napkin on your lap when seated. The napkin should be folded towards your body and if you are dealing with paper napkins, just do your best. When you leave the table during a meal, place your napkin on your seat and when you are done with your meal you can dispose of it. Keep your drink to the right side of your plate and do not put your phone, id, or your purse on the table. If you need to leave the table at any time you can simply say, "excuse me" without further explanation. Never cut any line when waiting for food; first of all it's rude and second of all you never know how hungry people will react to you getting between them and their food! Always move quickly through line and have your order ready before getting to the counter to aid the workers in efficient service. Do not attempt to carry more plates than you can manage back to your table. You are asking for a disaster! Remember, you can make multiple trips if necessary (this is especially relevant for TCNJ students like me since using a tray labels you as a freshman). If the dining hall is particularly crowded, do not linger after your meal. If you wish to socialize more with your friends then you can find another place instead of taking up tables that other students are waiting for. Hopefully these tips will prove useful and help you enjoy your dining hall experiences! If you are interested in general table etiquette and place setting requirements you can read more here.